For a good while, I have been pointing out that the Coast Guard really does not have a means of forcibly stopping a medium to large ship, if its crew is willing to risk death. Even the largest guns the Coast Guard has (76 and 57mm) are unlikely to be able to reliably stop such a ship, and those larger cutters that carry the 76 and 57mm guns are unlikely to be available when needed anyway. They are more likely to be either deployed far from the ports or in maintenance status, unable to respond in a timely manner. There are also no other US military forces positioned and ready to respond to this type threat. Photo: This is a Chinese experiment with improvised armament for civilian ships. 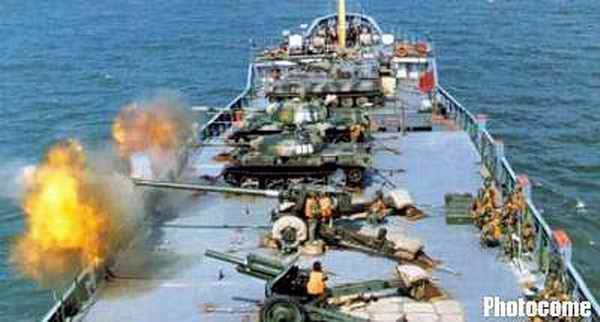 Likely useful systems include anti-tank guided missiles, recoilless rifles, heavy machine guns, man portable anti-aircraft missiles, and anti-aircraft and anti-tank guns which are designed to follow fast moving targets allowing them to compensate for movement of the ship. Terrorists would probably make more of an effort to hide the weapons, but you get the idea. I believe light weight torpedoes are the lightest, cheapest way to provide the missing capability. Until recently, I had assumed, we would have to at least reprogram some of our existing light weight torpedoes. Recently I saw a report that the Mk46 mod5 has an anti-surface capability, so it may not be necessary to create or modify a torpedo for the role. Despite its age, the Mk46 appears adequate to stop most ships. It has an unclassified reported speed 45 knots and a range variously reported as at least 8,000 yards. Its warhead wight is only 98 pounds, about 15% that of the Mk48 heavy weight torpedo’s 650 pound warhead, but the effects of underwater explosions are not proportional to the weight of explosive. The effect, assuming the same explosive is use, is proportional to the cube root of the weight of explosive. This means that the shock experienced as a result of a 98 pounds of explosive underwater is more than half that experienced as a result of the explosion of 650 pounds at the same distance. We might convince the Navy that putting torpedoes on Coast Guard cutters, is just another place to store them until needed. We are not likely to expend many of them, and if we use one or two, I think they will forgive us. 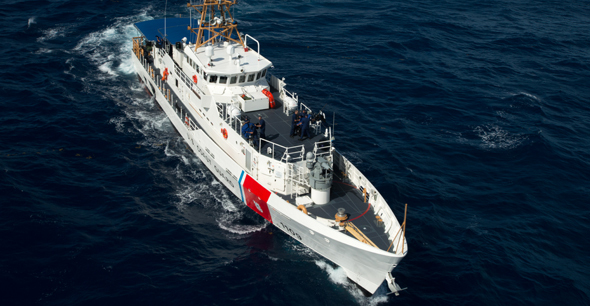 If there is a terrorist attempt using a medium to large ship, a Webber class WPC is likely to be the most capable Coast Guard unit available to attempt to stop the attempt. Larger ships are likely to be either far away or unable to get underway in time. Perhaps in the future we could also equip the larger cutters and the 87 foot WPB replacement with these weapons, but the WPCs should be the highest priority. American light weight torpedo launchers are all designated Mk32, but they are available in three configurations, triple, stacked twin, and single. The single tube fixed Mod11 is the lightest and probably most appropriate for the WPCs. Two torpedo tubes and two torpedoes are probably sufficient. Support equipment can mostly be left at a support facility ashore. These systems are relatively small, 11’4″ in length and less than two feet wide. Loaded with a Mk46 torpedo, each tube weighs 1160 pounds. They do require 9’6″ of open space behind the breech for the tray used to load the 8’6″ long torpedo. I see three likely locations. All three would require some minor modifications to the ship. On the stern aimed aft to fire over the transom. On the O-1 deck behind the bridge firing forward and slightly to the sides. On the O-1 deck forward of the bridge firing forward and slightly to the sides. The first would require some rearrangement of deck outfit. The second and third options would likely require about a three foot wide and 12 foot long extension to the O-1 deck on both sides essentially covering the walkway between the main deck superstructure and the side of the hull. This would allow mounting and access to the tubes which would be pointed at a shallow angle outboard placing the muzzle just inside and above the ship’s side. The breech would be angled in so that it is accessible for loading from the clear space behind it. Personally I prefer the second or third options. If there is ever a question “Are cutters are large enough to launch a light weight torpedo?” this should dispel any doubts. 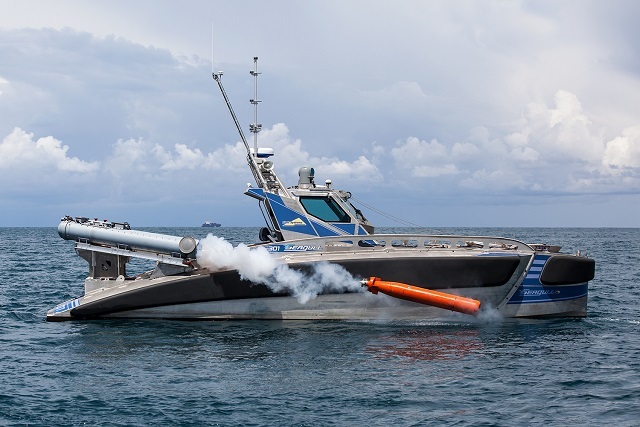 Below is a photo of a 12 meter (40 foot) Unmanned Surface Vessel with two torpedo tubes. It also has a dipping sonar (presumably the type used by helicopters). This entry was posted in ASuW, Fast Response Cutter, FRC, Weapons, Webber Class by Chuck Hill. Bookmark the permalink. One thing worth considering is that this would demonstrate a commitment to Department of Homeland Security mission and one that no other agency in DHS could fulfill. Once a Coastie, always a Coastie. With the prevalence of horizon range missiles are the days of torpedoes being effective for surface combat over? There are any number of crew service anti-armor missiles that could make a target too dangerous to approach. As such I wonder if something along the lines of a Avenger turret mounted to the VERTREP pad is more effective. The crew served missile (anti-tank guided missiles) have limited range, and putting them on the cutters would not be effective in stopping medium to large merchant ships. Hellfire’s range is only about 8,000 yards and it is one of the longest ranged. The only other suitable weapons are Anti-ship cuise missiles which are much heavier, more expensive, and would require multiple hits to achieve our objectives. Two thoughts: Did you consider the side launcher as used on WW2 PT boats? As you know Bob Stoner (RIP) advocated hanging Spike-ER missile tubes off the Mk 38 Mod 2 gun system. That would help with smaller vessels which attacking or otherwise needed neutralization. I don’t know if the side launch, toss over the side, would work with these, it might tumble the gyro and also the tube provides protection for the torpedo and a heating system for when the mechanism might otherwise be frozen up. Once we start sending boats to SW Asia or perhaps even Guam, it might be a good idea to upgrade other weapons. BAE says they are looking at putting missiles on the Mk38 mod3. Definitely desirable if you have to counter swarm tactics. I believe the mk 38 mod 3 has provision for a coaxial missile launcher. The types of missiles or rockets that could be accommodated though would probably not be effective in the scenario Chuck outlines. Not a big enough warhead to decisively stop a rogue ship determined to cause harm. Malph, sorry I never answered this. They could probably mount either a couple of Hellfires or multiple APKWS, the guided 70mm rocket. Both would be good if the threat were small fast highly maneuverable craft. Might also get lucky against larger vessels. Still the USN has not moved in that direction. Until they do, the CG will not get the capability either.